Today's winner will receive four chocolate mocha solid sugar scrubs, a lemongrass poppy seed soap, and a hand knit washcloth courtesy of Mary at Heaven & Earth, LLC. We've known Mary for years and are so impressed with the work that she's been doing to help educate people about the importance of sustainability and healthy living. We're also thrilled by her generous donation and continued support of Paper Doll Romance. 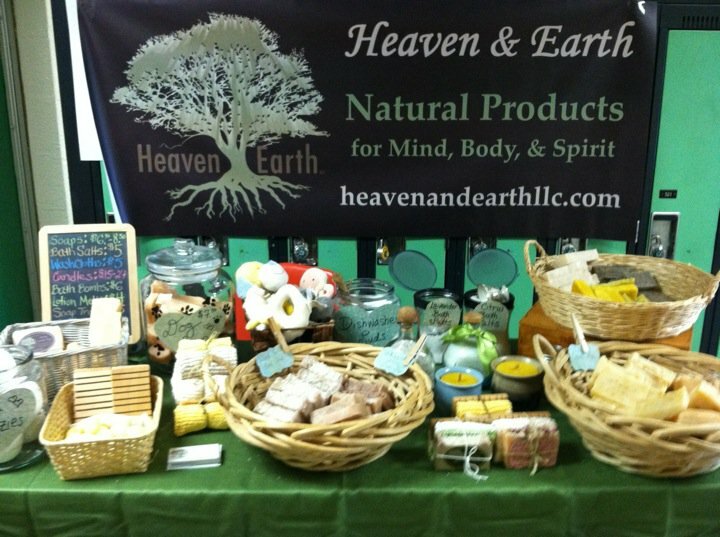 Interested on learning more about Heaven & Earth and their natural, organic products? There are lots of ways to connect with Heaven & Earth online! Be sure to visit their website to order, "Like" them on Facebook, follow them on Twitter at @HeavenNEarthLLC for great recipes and updates, and visit Mary's blog to see what she's been up to and what tasty treats she's cooked up! I grew up in Jackson, NJ, lived out of state for a little while, and now I live in Bayville, NJ. I wear several hats: wife, daughter, sister, friend, college professor, director of a nonprofit group, and I am the Co-Owner of Heaven & Earth, along with my Mom, Cathie. Heaven & Earth is all about health, wellness, sustainability, and education. We make natural products for mind, body, and spirit, and we will soon be Certified Holistic Health Coaches on top of that, so we can teach people not only about what they put on their skin, but what they put in their bodies as well. 2. What made you decide to start your business? When did you get started? We got started in November 2009. It's kind of an interesting story. My Mom found an article online highlighting several women who made amazing career changes. One of the women was a marketing director (I was also a marketing director at the time). This woman felt like something was missing in her life, and she basically quit her job, moved to her grandfather's farm in TN and turned an old barn into a soap studio, and used her marketing talents to open a cute soap business. My Mom sent me an email with the text "You have to read this." I contacted the woman in the article, and she was so kind and inspirational. And then after not much time at all, Heaven & Earth, LLC was born. 3. Do you have any materials that you'd say are your favorite to work with? I love natural and organic, fair trade materials from God's good earth. The more natural, the better! Some of my favorites are coconut oil, shea butter, cocoa butter, dried flowers, and essential oils. I draw inspiration from the earth. I used to be very separated from nature, and once I started to embrace this lifestyle, I felt truly alive, healthy, and happy. Work hard and follow your heart, and anything is possible. I like Cherry Amaretto Coconut Milk Ice Cream! Thanks so much to Heaven and Earth, LLC for their generous donation! Congratulations, Elizabeth. Enjoy those luxurious scrubs and soaps!